High-speed, 4-needle, cylinder-bed, needle-feed, double chainstitch machine. APPLICABLE: For the attaching of waistbands to jeans, casual pants, etc. ♦ Max. stitch length - 4,5 mm. High-speed, flat-bed, 2-needle double chainstitch machine with parallel 2-needle. Finished seams of higher quality. APPLICABLE: For hemming, welting and decorative stitching. ♦ Needle gauge: 3,2; 4,0; 4,8; 5,6; 6,4; 8,0; 9,6; 12,7; 19,1 mm. High-speed, flat-bed, 2-needle double chainstitch machine with tandem 2-needle. Finished seams of higher quality. APPLICABLE: For finished seams for light- to medium-weight materials. 1-needle, double chainstitch, differential-feed machine. APPLICABLE: For finished seams in elastic and light- to medium-weight materials. ♦ Max. stitch length - 5,6 mm. 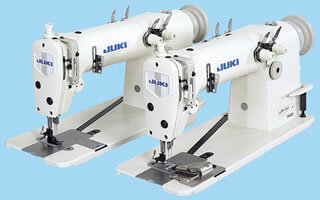 1-needle, double chainstitch, differential-feed machine with automatic thread trimmer. APPLICABLE: For finished seams for light- to medium-weight materials . APPLICABLE: For topstitching on the front facing of men's wear, as well as front flies, pocket mouths and trouser sides. ♦ Pinpoint stitch width (needle gauge) - 5 mm.